Unlike the it’s predecessor it will not be developed by Rare and Nintendo instead it is being developed by a Eurocom and Activision. Having Activision involved in the mix may scare some people but this shouldn’t automatically discredit the game. Activison and Eurocom can and do make good games. It appears all the original weapons are set to return including the Klobb which has apparently now been renamed as the Klebb and the game is supposed to contain most if not all of the original levels that it’s predacessor had. While it is supposed to have all the original levels the developer has said that the levels will not be rehashes of the originals and that several changes have been made. Multiplayer is presented in four-player splitscreen or eight-player online, with an experience points system that unlocks perks and this tends to be consistent with how Activison creates multiplayer games now days. Maps will be drawn from familiar locations, but the layouts will be changed from the way they were in the Nintendo 64 version. You will be able to use both the motion sensor to play the game or you can play the old fashioned way. This remake has me intrigued but I have the uneasy feeling that this game is going to be a simple rehash of the original with a few changes that make it different enough justify it but similar enough that it won’t require much in the way of creative process. 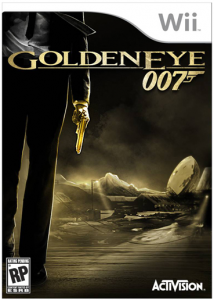 However, I have been wrong before and I hope I am in this case as Goldeneye 64 and the James Bond Franchise are one of my old time favorites. Here’s to hoping that Goldeneye WII is a remake the does the original Justice. i just can’t get past the fact that it simply looks like they ported the orginal n64 game graphics and had daniel craig do some voice overs for it. I know the WII is very weak on the power but couldn’t they have at least tried to update the look besides some new skins for the characters?